One of the challenges of the Christian author is being able to craft stories and characters that share their beliefs, but without being too heavy-handed about it. 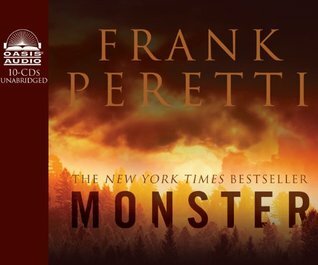 In Frank Peretti’s Monster, the author mostly succeeds, providing characters that can easily be identified as Christian, but also exhibiting the traits of normal humans instead of straight-up caricatures. The main plot of this book was only tangentially related to an argument against evolution, so that was also a plus. Still, the way the book was put together, it was clear where the author’s bias was. While some people might not appreciate the Christian undertones in this thriller, my qualms with it are more structural. Following a few different characters after a woman is abducted by an unnatural beast, the mystery of the disappearances and killings unravels to reveal a semi-plausible explanation. Unfortunately, the man and wife pair that are introduced at the start of the book are more annoying than likable. Ergo, when I followed the woman’s ordeal in captivity, I could not sympathize with her plight because her actions and reactions were so off-putting at first. In the end, Monster is still a passable—if perhaps boilerplate—thriller. I did appreciate the realistic explanation for the fantastical elements of the story. I also found it somewhat refreshing to show a character who opposed the common scientific view of evolution just because everyone else thought it was true. For an audiobook, the author’s narration was filled with just the right amount of emphasis, which is to be expected. However, with so many short scenes and quick cuts between them, his reading could have stood to have a little bit longer pauses between sections in order to give the listener a better sense that the scene was changing from one character to another. A passable thriller with semi-subtle Christian undertones, I give Monster 3.0 stars out of 5.